Wal-Mart is working with law enforcement officials to investigate Sunday's incident. (CNN) -- New Jersey authorities are investigating an announcement made over a public address system at a southern New Jersey Wal-Mart telling "all blacks" to leave the store. Shortly before 5 p.m. Sunday, an unidentified male accessed the public address system at the Turnersville, New Jersey, Wal-Mart Supercenter Store, Gloucester County prosecutors said. "All blacks need to leave the store," the voice announced. Store management contacted the Washington Township Police Department, which opened an investigation in conjunction with the county prosecutor's office, Deputy Police Chief John Dalesandro said. "The incident is being investigated by both law enforcement agencies as a suspected bias intimidation crime," local authorities said. He emphasized that Wal-Mart, the world's largest public corporation, is working with law enforcement officials in investigating the incident. Both police and prosecutors are reviewing security camera video from the store. Any of the 25 in-store telephones could have accessed the public address system, although not all phones are within range of surveillance cameras, authorities said. Dalesandro said there is no word yet on whether tapes of the announcement will be released to the public to help identify a possible suspect by voice. "We don't think it was an associate, but we are working with police to make that proper determination," said Wal-Mart's Lopez. Also, authorities confirm that some of store's telephones can be accessed by customers. Some of the store's telephones could be accessed by customers, authorities confirmed. 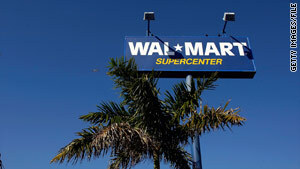 Law enforcement officials said Wal-Mart is acting to limit the public address feature to a smaller number of in-store telephones. Lopez confirmed the New Jersey store is updating its intercom systems and said the company is looking at Sunday's episode to see if there are any lessons for the retailer's other 4,000-plus American stores. "Some of our customers are upset at us, and I understand why they're upset," Lopez said. He said he agrees the burden lies on Wal-Mart to "do due diligence," he said his company can be an easy target for negative publicity, cautioning that the responsibility for the announcement "rests on the individual." "These things happen and you've got to wonder what goes through peoples' heads," Lopez said.